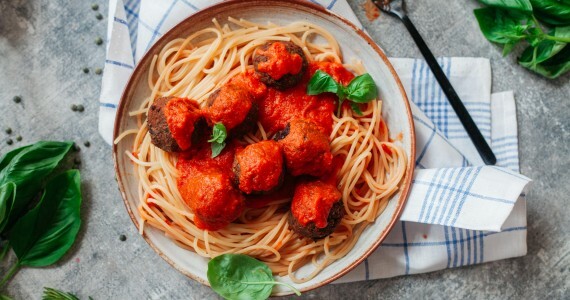 This delicious recipe for meat-free Lentil & Aubergine balls is perfect served with a comforting, hearty tomato sauce. The recipe is simple and quick, and also low on cost too - a great pasta dish for Meat-Free Mondays or to serve to vegan or vegetarian friends! 1) Preheat your oven to 180C and line a baking tray. Heat some oil in a pan and frying the aubergine, garlic and shallot until softened. 2) Place into a blender with remaining ingredients - apart from the breadcrumbs - and blend until the lentils and aubergine breaks down and the mixture becomes uniform and sticky. 3) Season to taste, then stir through your breadcrumbs. If your mixture is still a little sticky, add some oats or more breadcrumbs. Shape into 'meatballs', then bake until crisp and firm - around 25-30 minutes. 4) Serve warm with homemade tomato sauce and gluten-free Rizopia spaghetti.